What Happens When a Code Triage Sounds at a Level 1 Trauma Center? At the region’s only Level 1 trauma center, the staff unites as something more than a team. Plane crashes, train derailments and chemical-plant fires are the kinds of mass-casualty events that trigger a Code Triage announcement at Westchester Medical Center and Maria Fareri Children’s Hospital, both members of the Westchester Medical Center Health Network (WMCHealth). The alert signals that a large number of injured patients may be en route to receive care — whether due to a potential occurrence (a possible landing-gear failure on a nearby airplane) or a confirmed incident, such as the Metro-North Railroad train crash in Valhalla in 2015. As central components of the Hudson Valley’s only Level 1 Trauma Center, these Emergency Departments can provide care for burns, trauma and the most acute injuries. As in all triage situations, treatments have various levels of urgency. Most patients need near-simultaneous attention — and some may only have only minutes to live. At that point, dozens of clinical and non-clinical staff members mobilize to provide everything from heart monitors to hot meals. Security directs traffic, including incoming and outgoing ambulances, emergency personnel, and even family members who are looking for loved ones. “Ambulances can get blocked in if we’re not careful, and they may need to go back to the scene to get more patients,” Doering says. To safeguard flow and avoid congestion, the department directs ambulances, staff’s cars and other vehicles to specified zones. 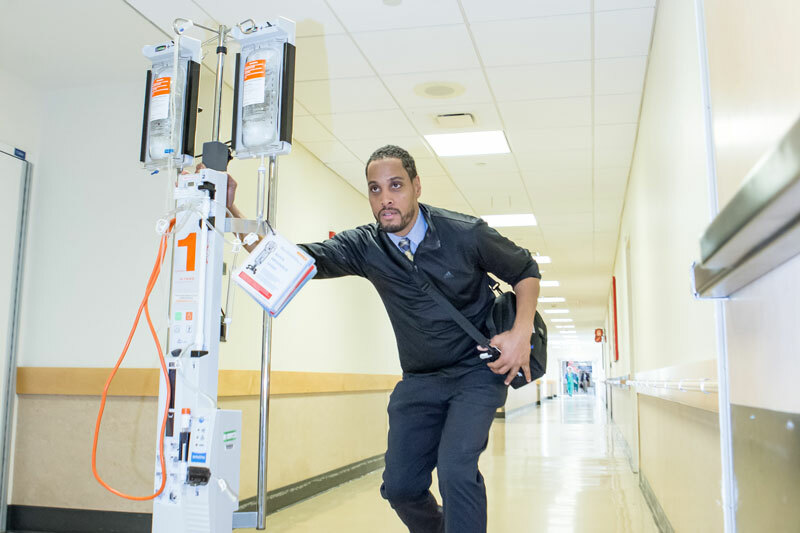 The Emergency Department staff relocates “stable” patients to make space for a new wave of wounded. “Nurses identify patients who can be moved to other floors and consolidate existing patients into available rooms,” Doering says. The Courier department escorts patients to nurses on other floors, then brings 30 to 40 stretchers and wheelchairs to assist the new patients. 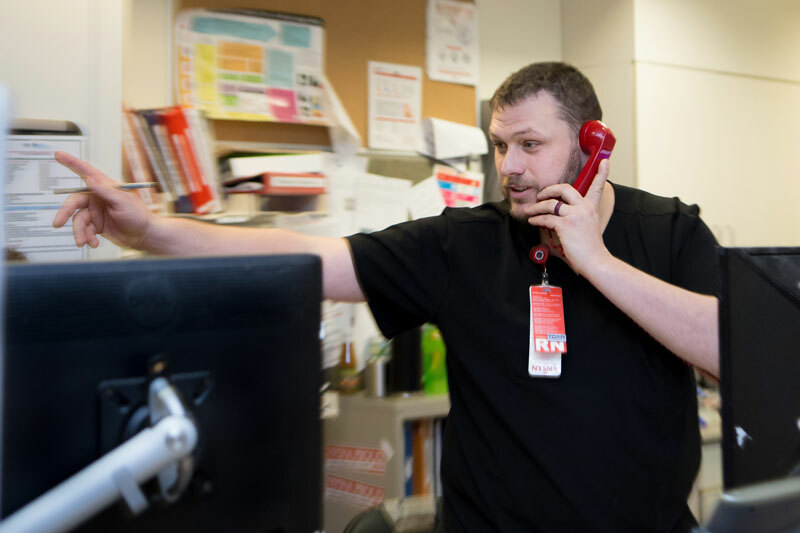 Phil Schacter, RN (pictured), the Emergency Department charge nurse on duty this day, calling the shots during a Code Triage. The Food Services staff prepares hot meals and delivers them to the Emergency Department or waiting room, along with snacks and water. “We know there will be anxious people standing around who haven’t eaten,” Doering says. Pastoral Care offers counsel, support and a listening ear to meet the spiritual needs of patients and their families. Child Life specialists assist the clinical staff by evaluating children, explaining events in terms they understand, mentally preparing them for procedures and reducing anxiety and stress for patients, parents and siblings alike.